Facebook has just released version 3.2.2 of Facebook for iPhone which fixes the dreaded login issue which has been plaguing users ever since Facebook rolled out the major version 3.2.x for “Places” last week. This is third update for this app released in a span of only four days. 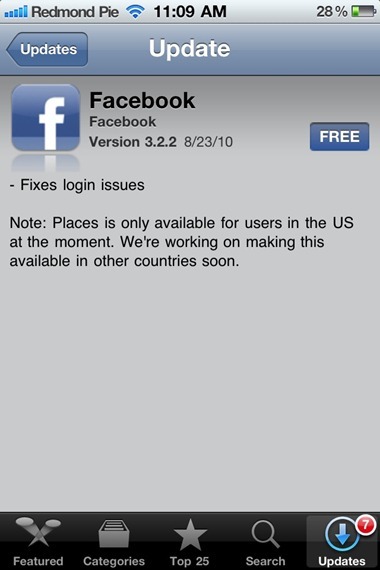 Both the Facebook for iPhone 3.2 and 3.2.1 were released on 19th of this month. Note: Places is only available for users in the US at the moment. We’re working on making this available in other countries soon. Hit the update button now and let us know if all your issues have been resolved ! Check out our iPhone Apps Gallery and iPad Apps Gallery to explore more apps for your iPhone and iPad. they need to make sms updates for places check ins if this is gonna compete with gowalla or foursquare. Why Facebook Group is not available yet in the application? Yes it worked great for me. Fixed my login information. Still not working on my ipad…. In the meantime, BiteSMS has also released a fix to address this issue. I’ve installed it, and am preparing to test it out, now. It’s amazing that they fixed this just for jailbreakers. I guess all those people that rated the app 1 star got a reaction from the developers. Facebook was working fine for me until I updated it to this latest one and now it is not working! What!